“These products from Sony Creative Software are the perfect addition to our portfolio. We have already strengthened our presence in the United States in order to propel development and sales. This autumn, we plan to release new versions of the video-editing programs Vegas Pro and Movie Studio, which are heavily oriented toward the customer requirements of today,” says MAGIX CEO Klaus Schmidt. On May 24, 2016 MAGIX officially confirmed the acquisition of a large portion of Sony Creative Software products, including Vegas Pro and Movie Studio. The public interest was overwhelming. Long-time Sony Creative Software users especially greeted the news with joy. We received many questions concerning the takeover of Sony Creative Products in the last few weeks. We are happy to receive positive feedback and constructive input, and would like to shed some light on what may be still be unclear. Exactly which Sony Creative Software products belong now to MAGIX? What does the takeover mean specifically for my Sony Creative Software products? Can I use existing serial numbers to reinstall my product? Yes! You can continue using your purchased serial numbers. You can currently register via sonycreativesoftware.com. Presumably starting at the end of August MAGIX will seamlessly take over the registration process for the acquired products. Where can I now buy Sony Creative Software products? At this time, the products can still be purchased through the Sony Creative Software web store and in retail stores. In the following months, purchases will take place via our MAGIX online shop and our sales partners, and the products will be removed from the Sony web store. Who should I contact in case I need support, and which options are open to me? At the moment, Sony Creative Software support portal will take care of customer inquiries. Starting at the end of August, MAGIX will completely take on the technical support. What will happen to the Sony Creative Software community forums for products acquired by MAGIX? Sony Creative Software will provide us with a digital copy of each relevant forum. We are currently exploring options for integrating existing contents into our existing forum system. We appreciate this community just as much as Sony Creative Software does, and we would like to guarantee smooth import of their contents. What’s in the future for the products acquired by MAGIX? 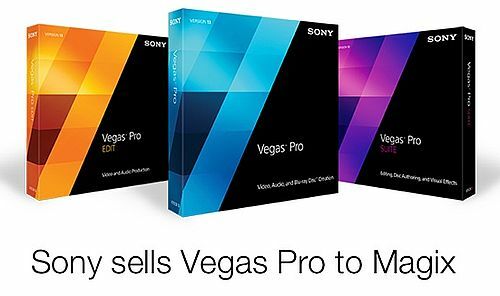 Gary Rebholz, product owner of Vegas Pro and Movie Studio, together with a small group of talented developers and former Sony Creative Software employees, will continue to work on the products. The highly motivated developer team in their studio in Madison, Wisconsin will get additional support resources from our tech experts in Germany to optimize our development process. In addition to bug fixes, performance and stability improvements, some new features such as native HEVC/H.265 support are planned for the autumn release of Vegas Pro. No classic subscription model is planned for Vegas. No overlaps with MAGIX video products are planned. All existing products (including Movie Edit Pro and Video Pro X) will be continued to be released in parallel and optimized with new developments and updates. Sony Creative Software products like Sound Forge, SpectraLayers and ACID Pro are a great enrichment for our audio sector. It is our desire to take user wishes into consideration through an intensive dialog and implement suggestions for improvement in order to present the best possible version of the software. Starting immediately, MAGIX is responsible for all acquired products. We thank you for your continued support and valuable feedback.